Meeting of breeders, owners and fans of the breed Rhodesian Ridgeback. Public Event for members and non-members as well. Arrival, free entertainment, games and socialization of young dogs, sitting by the fire and drinking some wine. Venue: Recreational area "Piatrová", Vrutky in a beautiful mountain environment. Friday Arrival, free entertainment, games and socialization of young dogs, sitting by the fire and drinking some wine. Slovak information portal RRSK celebrates 20 years! We as Ridgeback-fans are already 20 years accompanied by *Slovak information portal of Rhodesian Ridgeback breed*. It brings us the lates news and all other information from our country and abroad regards our breed. On this occasion a special exhibition *RRSK History Cup 2017* will be held. It will be associated with a pleasant weekend full of events in a cosy, natural environment of Central Slovakia. Not only breeders, owners and fans of Rhodesian Ridgeback are welcome but also all passerby and everybody who is interested in the breed itself and its nature. RR breeding at Slovakia celebrates 25 years! 25 years have passed since the first registered litter of Rhodesian Ridgeback was bred in Slovakia. 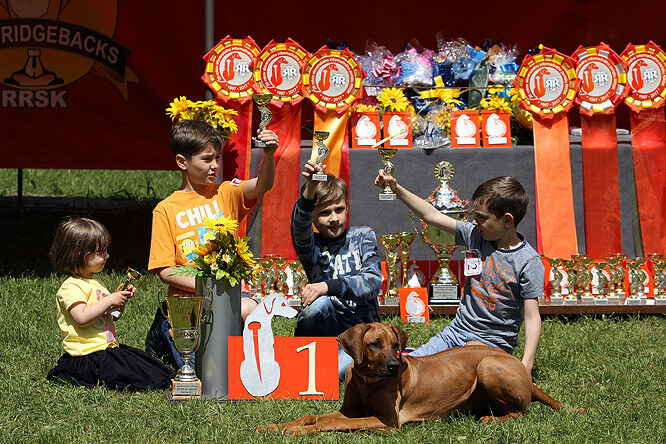 On this occasion we will held a meeting of breeders, owners and fans of the breed Rhodesian Ridgeback at "Piatrová” with the founders. A weekend devoted to the breed and to anyone who wants to recall and honor the beginnings of RR breeding. Meeting of breeders, owners and fans of the breed Rhodesian Ridgeback with the founders. Both exhibitions are open to the Rhodesian Ridgeback breed, standard and non-standard, owned by members and non-members as well. Foreign exhibitors are very welcome. The exhibitions are "unoficial", without FCI titles. Judged will be the quality of dogs, exterior and natural behavior in the ring with respect to the dogs well being. Lots of nice awards and titles, the list can be found below. after the show Gala banquet, where we will drink to the health of our breed for at least another 25 years. On this occasion there will be a group picture of the participating entitled "Rhodesian Ridgeback lovers and breeders over a quarter century." Also there will be commemorative plaques and medals and other awards handed. Copyright © www.rr.sk RHODESIAN RIDGEBACK SLOVAKIA. All rights reserved!